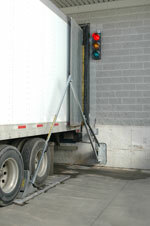 The loading dock is generally considered the most dangerous part a warehouse/material handling operation. Every year there are numerous injuries and fatalities when lift trucks drive off the edge of a dock or fall between the dock and the trailer. The number one concern when purchasing dock equipment should be safety. Read my article on Dock Safety. Dock levelers are used to bridge the gap between the dock and the trailer and adjust for any height differences. 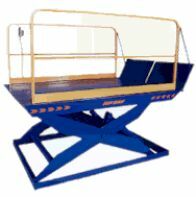 The pull-chain mechanical dock leveler is the most common type used. It is important to know the weight capacity of the dock levelers as well as rated safe height range. It is also important to have regularly scheduled preventative maintenance performed on dock levelers. A step up from the mechanical dock leveler, the hydraulic dock leveler uses an electric pump and hydraulic cylinder to engage/disengage the dock leveler. This works from a remote switch which is generally mounted on the wall next to the dock. Docks with high volume will benefit from this automation. The most dangerous aspects of loading and unloading trailers is trailer creep caused by a lift truck entering and exiting the trailer or when a driver starts to pull away from the dock while he is still being loaded. 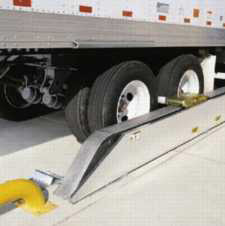 While wheel chocks can help they are not as effective as an automated restraint system. The ICC Bar type restraints automatically engage the rear impact guard on the trailer when it backs into the dock. After the trailer is loaded/unloaded the restraint is disengaged via a control panel. There are numerous variations on wheel chocks and wheel restraint devices. The Image shown on the left is a variation of a wheel chock that provides several improvements, including a skid plate that locks the chock in place, and sensors that connect to signaling devices. This dock leveler has a built in steel barrier which prevents the lift truck from going over the edge of the dock when the leveler is not engaged onto a trailer. Elevating docks are used where a raised dock is not available. They operate via an electric pump and a hydraulic lift cylinder. Generally these are used with a hand pallet jack to unload trucks although I have seen them used with forklifts. Dock seals come in a variety of configurations and are used to prevent air, dirt, debris, insects, birds, and rain/snow from entering the building while loading and unloading trucks..